South of Africa is launching the competition of all competitions in association with Modi Mall and two of its wedding venues: Shangri-La and Birdsong Cottages. 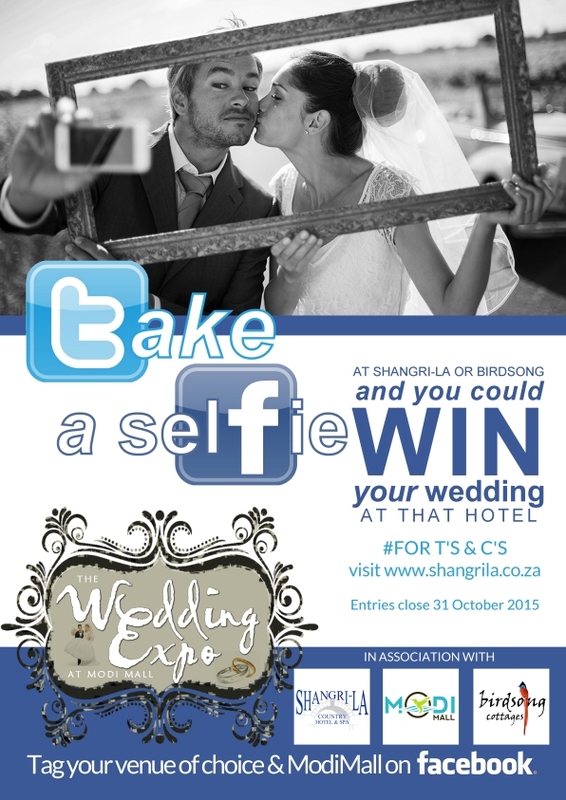 Couples that are planning to tie the knot have the chance to win their wedding at either of the two hotels, simply by taking a selfie at either venue on selected dates, post it online, and follow the easy steps. The two lucky couples that has the most likes on their photo, will win their wedding. It’s easy – take a “Selfie” with your bride or groom to be at Shangri-La Country Hotel & Spa, or the Birdsong Cottages, share it on Facebook and tag the venue along with Modi Mall, and have your friends and family like your picture. South of Africa is giving away TWO weddings – one at Shangri-La and one at Birdsong Cottages. The picture representing each venue that has the most likes, will win a wedding to the value of R20 000!!!! • When you see your picture on the timeline, ask your friends to like your photograph. • The photograph on each venue’s timeline with the most likes at 12pm on 31 October 2015 will be chosen as the winner for that property. Two prizes are up for grabs – 1 wedding at Shangri-La Country Hotel & Spa, and 1 wedding at Birdsong Cottages for 60 guests, including the bridal couple. Both venues are located on the outskirts of Modimolle. • All other items and costs not mentioned as part of the prize are the responsibility of the winning couple. • The winning couples may not transfer their prize to another party. • Should the couple terminate their engagement, the prize offer will be cancelled and will not be offered to the second photo of that property with the most likes. • Only photographs posted on the timeline of the participant’s chosen venue with the correct tagging of Modi Mall will be considered as an entry into the competition. • Entrants’ name and surname will be shared with the image on the venue(s) timeline. If the fiancee is tagged in the image, his / her name will also be shared. • Wedding must be held before 30 November 2016 and excludes peak season dates (1 December 2015 – 15 January 2016), special occasions (Valentines Day / Mother’s Day / Father’s Day / Woman’s Day) and Public Holidays or Long Weekends. • The prize may not be exchanged for cash. • The wedding date(s) are subject to availability. • Food may not be outsourced for your wedding. Specialized menus are available to cater to your needs. • Special overnight rates are available for guests that wish to stay on site or at South of Africa’s nearby hotels. • The venue will allocate a certain amount of time for the wedding subject to the time of day the wedding is held. • The winning couples are expected to meet with management of the venue to discuss the wedding plans. • Upon the announcement of the winners on Monday 2 November, the winning couples have until 14 November to claim their prize. Positive indentification is required. • The venue’s standard wedding contract covers all matters not mentioned on this website and the winning couple will be bound by these terms and conditions. • Facebook and Twitter in no way endorses or are involved in this competition. • South of Africa and Modi Mall will in no way be held liable for any damages that may arise from the sharing of the photograph and names as posted on the wall of the chosen venue. If entrants wish to cancel their entry into the competition, e-mail marketing@southofafrica.co.za with the request for the details and photograph to be removed.